Workshop panel, from L-R: Dr. Akhter Ahmed, Chief of Party, Policy Research and Strategy Support Program, IFPRI-Dhaka; Chief Guest, Dr. Shelina Afroza, Secretary in the Ministry of Fisheries and Livestock; and Dr. Agnes Quisumbing, senior research fellow at IFPRI and workshop Chair. 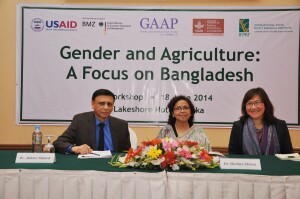 On June 18th, IFPRI hosted a one-day workshop in Dhaka, Bangladesh, entitled “Gender and Agriculture: A Focus on Bangladesh,” attended by more than 90 participants. 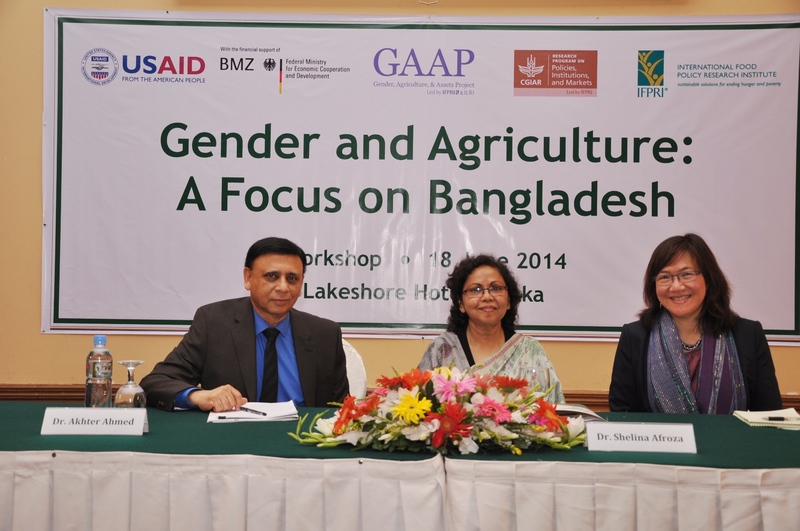 The workshop included presentations on multi-country agriculture and gender projects, with an emphasis on research results from Bangladesh. Chaired by Dr. Agnes Quisumbing, a senior research fellow in the Poverty, Health and Nutrition Division at IFPRI and co-Principal Investigator for the Gender, Agriculture & Assets Project (GAAP) and BMZ project, the workshop was sponsored by United States Agency for International Development (USAID); the German Federal Ministry of Economic Cooperation and Development (BMZ); the GAAP, supported by the Bill and Melinda Gates Foundation; the CGIAR Research Program on Policies, Institutions, and Markets (PIM); and IFPRI. The day was broken into three technical sessions: one on the Women’s Empowerment in Agriculture Index (WEAI), another on GAAP, and the third on women and climate change. All session Chairs and the Chief Guest, Dr. Shelina Afroza, Secretary in the Ministry of Fisheries and Livestock, were prominent Bangladeshi women from the Government of Bangladesh, civil society organizations, or the international development arena.